How am I going to get home today? Measured temperature at a nearby weather station. The problem is, I didn't dress for -15°C when I left home in the morning. In the morning it was balmy -5°C. And the forecast said -7°C. So no big deal. 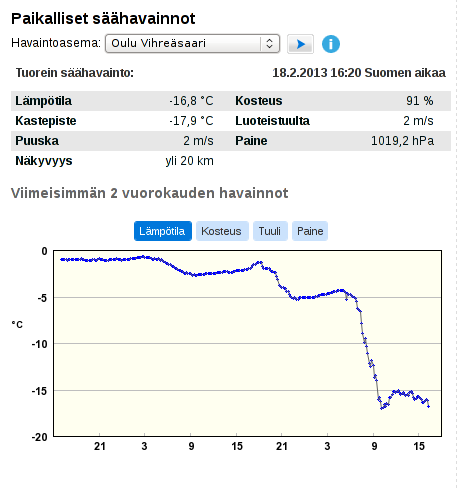 Now, suddenly it's -17°C. 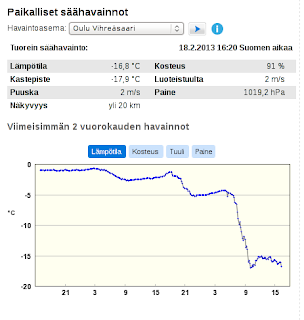 Last night the wind changed from south to west (at about 21 o'clock) and then from west to north (around midnight). It took a few hours for the colder air to arrive. I'll have to close the ventilation zippers in my jacket. And maybe lift the hood to keep my face warm, as I didn't take a scarf or ski mask with me. On the other hand, it'll be a good day to buy some frozen food: it will not melt on the way home even if I take a bit longer! A bike rack had been dug up, it's not buried under the snow any more! The wall of the parking cave construction site. Note the holes between the car and and the dark thing on the left. At first I thought someone had made unauthorized holes, but they were made by a saw! So curious people can take a peek. How nice! I just uploaded another masterpiece to youtube. It's from my ride this afternoon, at about 16:30 or so. Funny how the time flies, now there is enough daylight for my camera... the spring will be here soon! As I wasn't invited to the winter cycling congress, I didn't go there. (I'm a world famous blogger and I was not invited? What a disgrace!) But listening to boring speeches indoors will not give the visitors a good picture of winter cycling. They also had a bike tour so they could try it themselves. I thought the snow coming down was snow and not sleet so I didn't find my camera cover. But it was sleet so the camera clogged up and the end of the video is just a blur. Still, you see there's snow about. And riders on their way home. There was maybe an inch of fresh snow (in the early part of the video) but it was a bit too dark and beyond the capabilities of the camera so the surface of the bikeway is not clearly seen.